Action commands such as Navigate Link and Navigate URL commands are much slower to execute than commands that simply capture content, so it's important to try and limit the number of action commands in your agents. If you can access a target web page directly with a direct URL, rather than clicking multiple links, then you should always opt for the direct URL. Many dynamic websites show and hide content when you click on buttons or links. Content Grabber can extract both visible and hidden content, so it's often not necessary to add an action command that simply makes content visible. An agent spends most of its time waiting for web pages to load, and Content Grabber cannot always determine exactly when a page load or page action has completed, so it sometimes ends up waiting longer than it has to. If the agent starts extracting data too early, it may not be able to extract the data correctly, since some data may not have loaded onto the web page yet. An action command uses a set of timeout values to determine how long it should wait for new activities. These timeout values are set fairly conservatively to make sure they are long enough for slow computers and slow Internet connections. 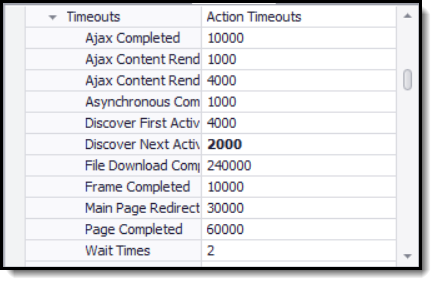 You may be able to lower these timeout values, so an action command completes faster without failing to extract content correctly.